Saturday's Times had a funny little parody of the RealAge quiz, which led us to ponder the true idiocy of RealAge. But the real RealAge test — at least two knockoffs of which now exist as Facebook apps — asks annoying stuff like your blood pressure and the much you drink and smoke, all to determine a number that is apparently more accurate than the actual number of years you have existed on this Earth. More accurate how, you ask? Well, since the RealAge homepage is chock-full of diet links, we guess your RealAge is supposed to reflect how old you look — you know, because fat=old and old=bad. But it's also supposed to measure how healthy you are, aka how far you are from dying. It's a well-known fact that all deaths are caused by a person's RealAge being too high, which in turn is caused by doing naughty things like drinking, smoking, being stressed out, and failing to take RealAge tests. 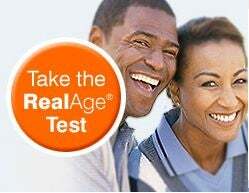 If you get in fatal car accident, your RealAge was probably 100 — if only you'd had the foresight to visit RealAge.com! Seriously, just one obnoxious aspect of the RealAge test is its insinuation that getting old and being unhealthy are your fault, and can be avoided by dropping a jeans size and eating fruits and veggies. Another disturbing wrinkle: if you answer yes to any of the sites many offers of a free RealAge membership, your info will be added to a database that drug companies can access. The result, according to the Times, is that companies can send you marketing emails. Some of these emails may try to sell you drugs for diseases your info indicates you might have, even if you haven't actually been diagnosed with them. Also upsetting is the implication that you should do things because they make you younger, and not because you enjoy them. RealAge's tagline is "Live Life to the Youngest" — they've handily replaced fulfillment and enjoyment with youth. Another Times article provides a depressing example of this mindset — apparently, listening to classical music now makes you younger. "Listening to finer music and attending concerts on a consistent basis makes your real age about four years younger," says Dr. Michael Roizen, "chief wellness officer of the Wellness Institute at the Cleveland Clinic." The article includes some interesting thought on potential musical therapies for ailments like anxiety and insomnia, and we're perfectly willing to believe that music can be good for you. But it's also just good, and fun, and the idea that it's supposed to make you younger takes away some of the intrinsic joy and power of it. We're not saying you should be eating bacon-and-cigarette sandwiches every day and playing in traffic for dessert. But if you do everything in life with an eye toward turning back the clock, you're eventually going to be very disappointed.